The smell of coconut oil takes me back to my childhood…perhaps you remember the deluxe tanning oil way back when, Hawaiian Tropic). For David, the smell of coconut takes him back to the Caribbean. Though our memories are years apart, we both remember those languid days of our youth and young adulthood spent frying in the sun. While I tend to reject the sun’s rays these days, he still loves to cover his body and hair in coconut oil before heading to the pool in the summer (which is not nearly as bad as you might think*). Now, we also enjoy eating coconut oil. That, along with coconut flour and drinking coconut milk and sipping coconut water. So, no matter what form coconut assumes, we’re a little nuts for coconuts. Studies show that the naturally occurring saturated fat in coconuts, a medium-chain triglycerides (also known as medium-chain fatty acids), is good for you and has a profound number of health benefits including improving your heart health, boosting your thyroid, increasing metabolism, promoting a lean body and weight loss if needed and supporting your immune system. Naturally, we are cooking more and more with coconut oil, using canned organic coconut milk in dessert recipes, drinking coconut water and taking a few glugs of the coconut milk in a carton when we take our vitamins. As for the coconut flour, a little goes a long way, so don’t be surprised when a recipe calls for 1/4 cup or 1 tablespoon, just trust that the measurement is accurate. This gluten-free and grain-free flour is a fabulous alternative to wheat flour and even rice flour, which plays a prevalent role in most gluten-free baking. Now that you know how great coconut is for you, how about a recipe that uses coconut four different ways? If you love coconut cream pie, but want to avoid the crust, this dessert is calling your name. 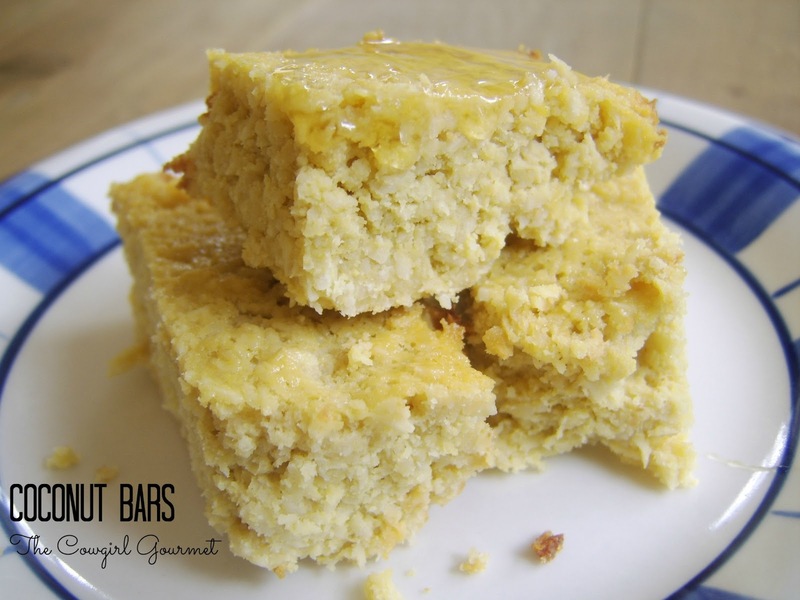 Made with canned coconut milk, coconut oil, coconut flour and unsweetened shredded coconut, the health benefits in ingesting this dessert are plentiful. And by using a locally produced honey–a natural aphrodisiac (it IS Valentine’s this week, right? )–the advantages only increase. The fact that this is delicious is bonus! Rather than making the usual decadent dessert for Valentine’s, try making these coconut bars instead. *Note: Coconut oil is a great skin moisturizer and, while you’re at it, massage a teaspoon or two into your scalp to eliminate dandruff and then on your hair for a terrific deep conditioner. If you are a lover of coconut, gather these ingredients and get to work. Really. These are good and so very, very easy to put together. Not too sweet and completely gluten and grain-free, you'll think you're eating coconut cream pie. But without the crust. In a small saucepan over medium heat, melt the coconut milk, coconut oil and honey together until combined. Remove from heat and let sit 10 minutes to cool. In a food processor, add the eggs, Ideal, vanilla and melted coconut milk-oil-honey concoction and mix thoroughly. (If your heated mixture is still a little hot, add just a bit in to "temper" the eggs and mix well. Then add the rest and continue to mix until combined.) Gently pulse in the almond flour, coconut flour, shredded coconut and salt until combined, but do not overwork. The mixture will be wet and somewhat thin. Transfer ingredients into an 8 x 8 inch baking dish. Bake at 350 degrees for 30-35 minutes until just the center seems a tad soft and wet. Cool for 1/2 hour and then place in the refrigerator to chill thoroughly which will take several hours, though it is best cooled overnight. When chilled, cut into squares and serve. If it needs a little more sweetener for your taste, drizzle a little of the local honey on top for extra fabulousness. Previous Post: « Go Red! Yum!! I am NOT a fan of coconut water, but I want to start using coconut oil more! I love coconut oil. It's amazing an has a million uses. I can't wait to try out this recipe though I have a feeling it will be one where I won't tell the hubby what's inside.